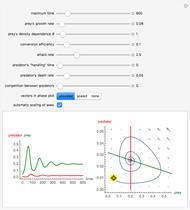 Stable predator-prey cycles are predicted by oversimplified Lokta–Volterra equations, but if biological realism is added, the dynamics often turn into damped oscillations or even monotonic damping. 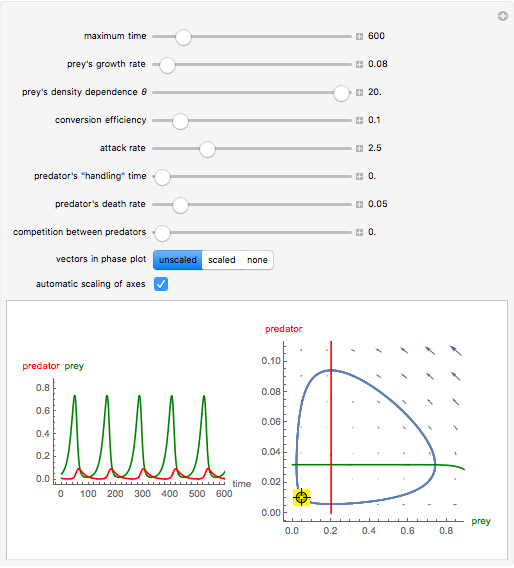 This Demonstration shows the type-two functional response for the predator and the theta-logistic growth for the prey. Stable limit cycles can occur only if—as a necessary but not sufficient condition—the prey isocline has a (local) maximum and its mode is at higher prey density than its crossing point with the predator isocline. The dynamics of predator-prey interactions can be predicted from the zero-growth isoclines of predator and prey. These isoclines are shown as red and green lines in the figure on the right. The densities of prey and predator are measured relative to the prey's carrying capacity (i.e., in the model). 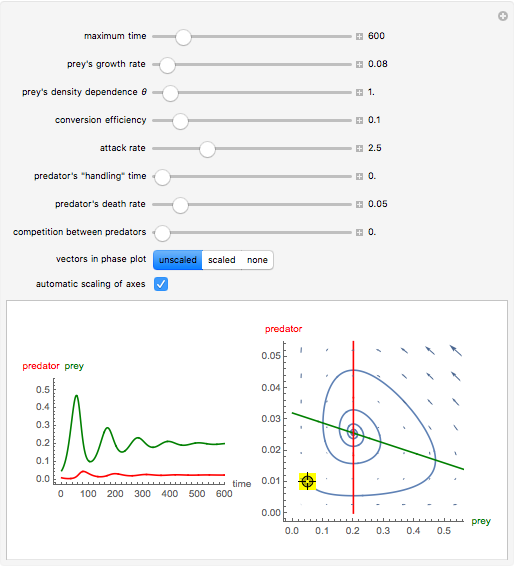 The simple model of Lokta and Volterra with its stable limit cycles is approximated by setting "handling" time and competition between predators to zero and the prey's density dependence θ to the maximum (Snapshot 1). Setting leads to the so-called logistic growth. 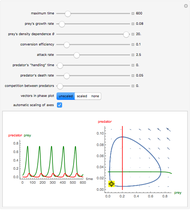 If such a realistic density dependence (Snapshot 2) is used or competition between predators is added (Snapshots 3 and 4), then the oscillations become damped. A nonzero handling time (Snapshot 5) implies that the consumption rate of the predator depends on the prey density according to Hollings's type-two functional response (see ecology textbooks). 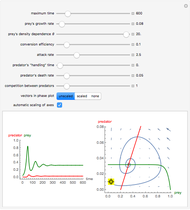 This can have a strong stabilizing effect leading to monotonic damping (Snapshot 6). With other parameter settings the crossing point of the isoclines can be shifted to prey values below the mode of the prey isocline (Snapshot 7 with damped oscillation), so that stable limit cycles (Snapshot 8) can occur. Attention! Some parameter combinations might need considerable computing time! The vectors in the phase plane can be removed ("none") or reduced in size ("scaled"). 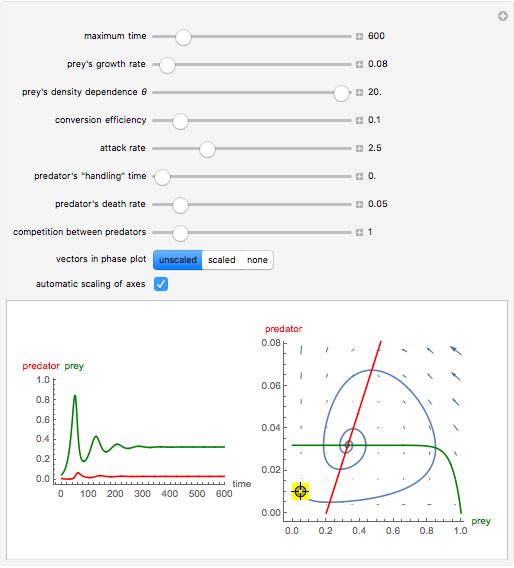 If the automatic scaling of axes is disabled, then axes lengths are fixed to 1.1 for the prey and 0.25 for the predator. You can change the starting values for the predator and prey interactively with the yellow locator. Click at the center of the locator and change its position carefully. Minimum starting values are 0.00001 and maximum starting values are 1.5 (or they are equal to the axes lengths if automatic scaling is disabled). Wilfried Gabriel "Predator-Prey Dynamics with Type-Two Functional Response"